CookN - Goldendale, WA. I can see! "I replaced the stock bulbs on my 2005 ZX10R with these. These added visibility that stock bulbs did not offer. Fit and work to my expectations. Now have more than 500 miles with them and do not expect any issues. 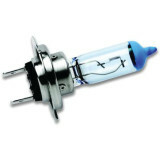 Buy from "Motosport" as I could not find these same bulbs at a lower cost else where. A Whiter light than stock Amber glow." Police - Los Angeles, CA Only one ? "For the price, should of been two bulbs. But NOPE!!! Only one. And the bike requires two."